Feminism and misogyny are problematic concepts in Korean cinema. While contemporary output is slowly starting to reflect the complex roles inhabited by women in Korean society, the male-dominated industry often submerges female narrative arcs within the central hero’s quest. As such, women’s issues tend to be explored through art-house and independent films such as the works of Lee Chang-dong, Im Sang-soo and Kim Ki-duk, yet these productions can also be problematic either for portraying women’s issues from a male perspective, or for their limited domestic release. When a mainstream film attempts such endeavors, as with rom-com You’re My Pet (너는 펫), the results can be quite extreme. Howling (하울링), from director Yoo Ha (유하), is promoted as a taut thriller involving the curious mix of spontaneous combustion and a killer wolf in a spate of homicides. Yet it is surprisingly primarily an examination of the difficulties faced – and endured – by women in the workplace. Yoo Ha is clearly more invested in this theme than the various disparate narrative strands, strands which never convincingly coalesce into a satisfactory whole making Howling an interesting yet disappointing thriller. Jo Sang-gil (Song Kang-ho (송강호) is called to the scene of a bizarre crime in which the victim seemingly died from spontaneous combustion. However, the presence of a wolf, stated from the testimony of a nearby drunkard, adds a complicated twist to the homicide. Reluctant to take the case yet desperate for promotion, Sang-gil begins to investigate with rookie cop Cha Eun-yeong (Lee Na-young (이나영), a partner he makes clear he neither wants or needs thus forging an antagonistic relationship. However, as savagely mauled bodies begin to appear, it becomes apparent this is no simple investigation and the hunt for the wolf is on. Sang-gil’s selfish motivations threaten to jeopardize the entire case while Eun-yeong’s by-the-book professionalism may well be the key to unlocking it. While Sang-gil attempts to overcome domestic issues and Eun-yeong the rampant misogyny within the police force, the two cops must set aside their differences to solve the mystery of the wolf murders. Howling opens as thoroughly standard fare with an unexplained death with hints of foul play, the rugged results-at-any-cost cop put on the case, and his forced partnership with an idealistic rookie which creates tension. However the film begins to excel when such American TV cop drama tropes are eschewed, and greater focus is bestowed upon the central pair and how they are forged within the Korea cultural system. For Sang-gil, as a single father of two attempting – and failing – to provide and take care of his family, his flaws are readily apparent. Continually passed over for promotion and mocked by co-workers, Sang-gil works hard on the case yet selfishly keeps the vital information to himself in an effort to obtain praise, and advance in the force. While the tough cop is very much to blame for the debacles that ensue, director Yoo Ha conveys him as a sympathetic protagonist while portraying the real enemy as the ‘points system’ in place within the police force as a means for establishing assessment. However, Howling is in fact Eun-yeong’s story. As an intelligent, ambitious, and diligent woman Eun-yeong possesses all the skills necessary to become a high-ranking detective. Yet from the outset her male colleagues think quite differently, ordering her to clean and arrange files, make crude jokes about her sexuality and relationships with others, as well as making sexual advances. The sequences in which Eun-yeong is forced to endure such torments are simultaneously chilling and infuriating, as the director meticulously composes tense, powerful scenes that emphasize her secondary status. As such, Howling is an incredible exploration of the role of women in the workplace in contemporary Korea. Yet as Eun-yeong’s trials take center stage within the narrative, the importance of the murders themselves dissipates. 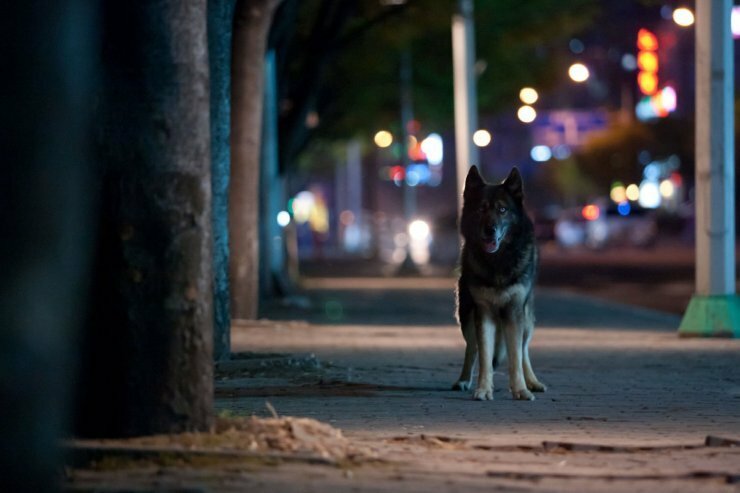 The homicides are generally quite farcical, from a bizarre instance of spontaneous combustion to the killer wolf stalking the streets of Seoul for victims. This is unfortunate as while these devices are somewhat trite the motivations behind the deaths are quite striking and provide another instance of keen social commentary. The importance of the examination is lost, or rather subsumed, beneath the various sub-plots and red-herrings intended to add mystery to the narrative, while the unbalanced focus bestowed upon the misogyny within the police force also detracts from any shocks. Interestingly, scenes in which Eun-yeong endures tirades of abuse carry much more potency and impetus than the murders, highlighting the director’s clear area of investment. Director Yo Ha has simply attempted to achieve too much within the running time, and as such each narrative strand suffers and doesn’t manage to coalesce or wrap up threads convincingly. Ultimately it is Eun-yeong’s story, rather than the killer wolf, that takes priority and Lee Na-young performs the role incredibly well simultaneously conveying tenacity and victimization with skill. Song Kang-ho, meanwhile, gives a solid rendition of a faulty cop yet he is never really stretched as in his prior films. As such, Howling is very much a thriller about the abuse of women in contemporary Korea first, and a murder mystery second. Howling is an interesting thriller, one that attempts to blend an array of socio-cultural critiques alongside traditional cop fare with spontaneous combustion and a killer wolf thrown in for good measure. Director Yo Ha never manages to converge all the disparate threads into a satisfactory whole, but he excels in conveying the misogyny endured by women in contemporary Korea, with some riveting scenes and a great performance by Lee Na-young.